Pies are so much fun to make! Even if you dont like to make the pie crust, there are a couple of tricks that will make the store bought ones taste a little more homemade and flaky! If you do like to make your own, the recipe on the can of Crisco is still my favorite! Easy and quick,it always turns out great. Before putting the top pie crust over the fruit filling, sprinkle about 1/4 cup sugar over the fruit! (This is if you are just using already prepared canned fruit pie filling) if you are using fresh fruit follow the directions from your favorite recipe and skip this step going straight step 5! If you are making apple or peach, use light brown sugar, all other fruits, use granulated sugar. Dot the top of the fruit with pats of butter before placing the top crust over the fruit. 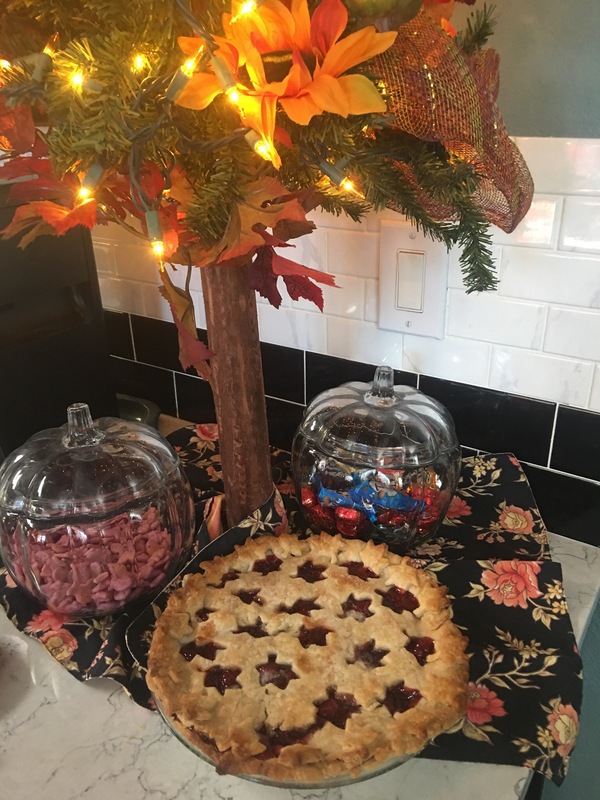 You can use minature cookie cutters (such as the fall leaf in the cherry pie above) to make different themes in the crust! Simply cut the top crust with the cookie cutter before folding the crust to place on top of pie. Bake at 400 until crust is golden brown.